If it’s about audio, it’s at AES, and the deadline for Early Registration is rapidly approaching for the biggest audio event of the year – the 139th AES International Convention in New York City, this October 29 – November 1, at the Jacob Javits Center. 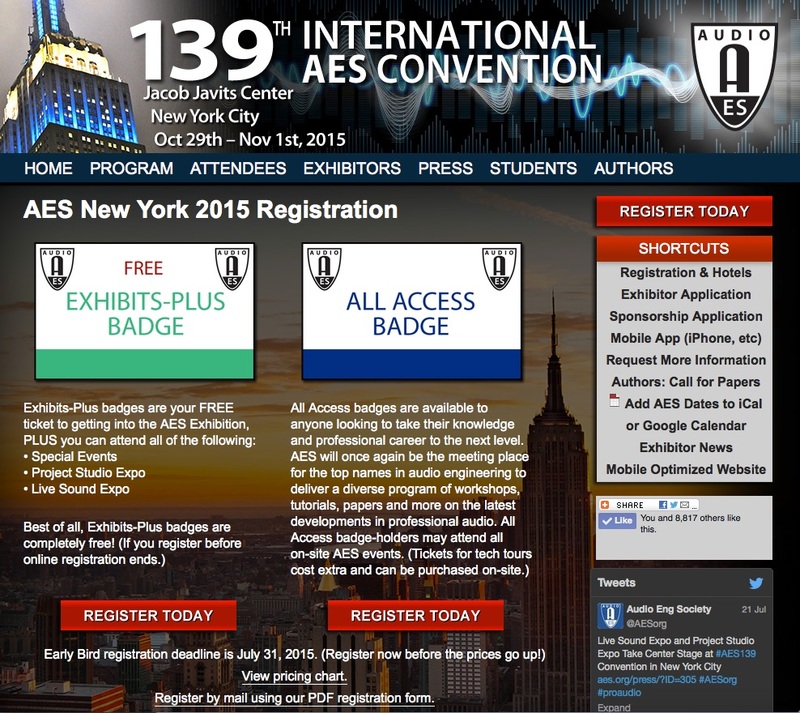 Register by Friday, July 31, to receive significant savings on your All Access pass to everything the AES139 Convention has to offer – from the Special Events and Exhibition Floor presentations, to four days of in-depth Tech Program Workshops, Tutorials, Technical Paper Presentations, Industry Networking and more. Other badge options are available for this year’s Convention: the FREE Exhibits-Plus badge and One- and Two-Day All Access badges. The Exhibits-Plus badge is your free pass to attending the world’s largest dedicated professional audio Exhibition and Special Events. The Exhibits-Plus badge will also give you access to the Opening Ceremonies and Awards, as well as the LSE and PSE presentation stages, and more. 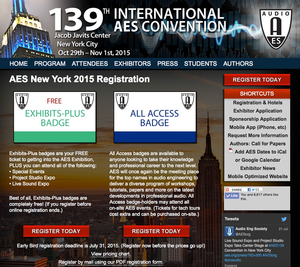 Exhibits-Plus badges are completely free with advance registration through the AES website. The AES has made arrangements with several hotels in the area to offer exclusive competitive pricing and reservations for AES attendees. For access to these special rates, visit the AES139 Convention Housing website and get in on special hotel packages available only through the AES. With a host of other events taking pace in the city, these reduced-rate rooms will sell out fast, and attendees may request hotel reservations online or contact the AES Housing Customer Contact Center: Monday through Friday, 9am to 9pm (Eastern Time); 1-800-483-2433 (Toll Free U.S. & Canada); 415-979-2296 (Outside U.S. & Canada); AESHousing@cmrus.com.